We've all been using accessories to compliment our wall colors and furnishings. Throw pillows, vases, and lighting are often cost effective and engaging ways to play up your decor scheme. Take it to the next level and plan a custom wallpaper project that emphasizes your accessories as opposed to wall colors and furnishings. The image shown is a custom wallpaper of a very interestingly colored marble. The reds of the vases, lamp, and fruit bowl pull the strongest reds out of the mural. The chartreuse throw pillows and floor pottery emphasize the greens in the mural that might normally be less noticeable. Tailoring a custom wall mural to accommodate your accessories is the perfect example of how fully you can customize your very own wallpaper. 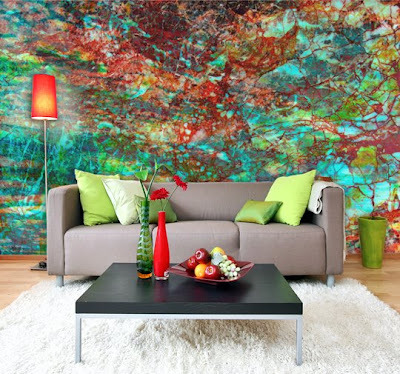 Having a bold wall mural will let your accessories shine even brighter in your space. Additionally, this strong connection of the custom wallpaper and accessories will make your accessory choices appear even more intentional and thought out. So don't think of your accessories as an afterthought in your room design, emphasize them with a wall mural that takes your decor to new heights. Pull together your favorite vases and baubles and contact us to start your custom wallpaper project.